Russian President Vladimir Putin has banned or curbed agricultural imports from countries imposing sanctions on Russia over the crisis in Ukraine. In a decree (Russian text), he ordered the measures, which also apply to food imports, to be introduced for one year. Meanwhile, renewed fighting in eastern Ukraine has forced the suspension of a search for the remains of the victims of crashed flight MH17. The attack on the jet has heightened tensions between Russia and the West. The Malaysia Airlines aircraft was brought down in July, killing all 298 people aboard, most of them Dutch citizens. The US and the EU accused pro-Russian separatist rebels of attacking the jet, mistakenly, with a missile supplied by Russia. The rebels and the Russian government deny the accusation. Efforts to investigate the cause of the crash, and to recover the remains of the dead, have been hampered by fighting between the rebels and the Ukrainian military, which is attempting to retake territory in the east. On Wednesday, Dutch Prime Minister Mark Rutte said the mission to recover the remains had been suspended because of renewed unrest. "It doesn't make sense to continue the repatriation in this manner," he told reporters in The Hague. "We have done what we could under the circumstances." Does this mean no more English cheddar at my local Moscow supermarket? No more German sausages? Or American chicken? That's unclear. The Kremlin decree doesn't specify which items will be affected. Instead, President Putin has ordered his government to draw up the list of food and agricultural products to be limited or banned. The Russian authorities clearly believe these restrictions will hurt foreign exporters more than the Russian economy. 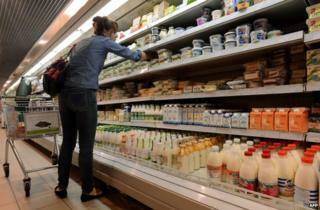 Moscow is already looking elsewhere for its food imports. It will hold talks this week with Argentina, Ecuador and Brazil. Judging from the language coming out of Moscow, there is no sign of the Kremlin backing down over its support for armed separatists in eastern Ukraine. Russia's deputy prime minister made it clear his country would defend itself "in a tough way, consistently and proactively" against foreign sanctions. Government departments in Russia have been instructed to come up with a list of products subject to the sanctions order. Russia has imposed import bans on other states in the past, but normally on grounds of public health. Wednesday's decree did not specify which countries would be affected by the new measures. However, the EU and US recently tightened sanctions on Russia, with Brussels applying restrictions to sectors of the economy as well as individuals. Image caption More of this on the menu in Moscow? Russian news agency RIA Novosti quoted an official from the country's agricultural and veterinary watchdog as saying that the new sanctions would apply to all agricultural products imported from the US. "Fruits and vegetables from the European Union will also be under full ban," the official, Alexey Alekseenko, is quoted as saying. Russia buys fruit and vegetables from the EU worth an annual 2bn euros (£1.6bn; $2.7bn), and food and agricultural products from the US worth about 1bn euros. Last week Russia banned most agricultural imports from Poland on grounds of public health in what was seen as a thinly veiled retaliation for Poland's advocacy of tough action over Ukraine. The Russian decree cites "national interests" as grounds for the latest measures. The list of goods being affected should be ready by Thursday, according to the Russian business daily Vedomosti. Wine and baby food will not be affected, it added. Russia, which was first subjected to sanctions after annexing Crimea in March, has been accused of fomenting the armed rebellion in Ukraine's eastern regions. Brussels hardened its sanctions at the end of July, amid growing anger over the downing of the Malaysia Airlines jet. The new EU sanctions targeted close allies of Mr Putin such as billionaire tycoon Arkady Rotenberg but they also hit exports of oil industry and defence technology and affected Russian state banks' access to Western capital.